The latest Honda Civic Type R has finally given in to the turbocharging trend and while some of that fizzy high-revving energy may have been lost in the process, the massive power boost should have most shoppers smiling at every prod of the throttle. Totally redesigned for 2017, the Type R is a big step up from its predecessor and its extrovertly styles exterior hints at some serious performance potential. Gone is the previous Type R’s quirky two-layered dashboard design, in its place is a modern and more conventional cockpit with the obligatory touchscreen controlling most of the vehicle’s functions. A slightly confusing menu system can make accessing certain controls a frustrating affair though. The sports seats are very supportive up front and great for longer journeys too. Rear passengers will also feel comfortable, head and leg room is as good as in any other Civic. The good news continues to the trunk which offers plenty of cargo space and a split-folding rear seat comes standard.Quality levels are high too and the materials used on the dashboard and door panels are as good as any of the competition. All too often a powerful front-drive hatchback loses the plot when it comes to traction out of corners but the Civic Type R uses its limited-slip differential to great effect, providing a level of grip and handling composure usually reserved for far more expensive rear-wheel drive machinery. Its record-breaking Nurburgring time may be overused as a marketing tool but it does underline this cars overall competence and the brakes and suspension are designed to withstand a lot of punishment. That all of this dynamic ability comes without the usual cost of a hard and jittery ride is a real bonus. This makes the Type R a very versatile machine, equally at home as a daily driver and a weekend track toy. The Type R enters the hot hatchback fray with a 2.0-liter turbocharged engine which produces 306 horsepower and 295 lb-ft of torque. Power is sent to the front wheels through a complex limited-slip diff and only a 6-speed manual transmission is offered. 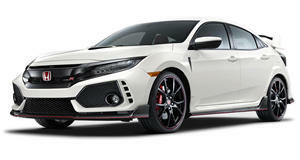 This combination may lose the Type R a few tenths away from the lights but it will surely excite the hot hatch purists. For the record, the 0-60 mph time is completed in a hair under 6-seconds but this just doesn’t convey the ferocity with which it accelerates through the gears. The Civic Type R is available in one trim level, incorporating all of the specifications found in the top spec Civic models with Touring Trim, it also adds a whole host of bespoke Type R options too. Notable standard features, satellite-linked navigation system, cruise control, adaptive dampers, 7-inch touchscreen incorporating Apple CarPlay and Android Auto as well as Bluetooth connectivity and a 12-speaker audio system with Sirius XM radio. Safety systems include brake assist a rearview camera and LED daytime running lights and are also complemented by a full set of airbags and traction control systems. Items like the aluminum shift knob, black/red leather-wrapped steering wheel, sport pedals, high-bolstered sport seats with red/black suede-effect fabric and 20-inch alloy wheels are unique to the Type R.
Optional extras are limited with the most notable being a selection of 5 exterior colors, a wireless phone charger and illuminated door sill trim. It has been a long time coming but the 2017 Honda Civic Type R is as good a package as enthusiasts hoped it would be. The aggressive exterior design is backed up by class-leading performance and handling. The spacious interior and comfortable ride elevate the Type R above less capable hot hatches and provides it with a level of daily practicality that will make it a favorite with shoppers looking for a multi-talented hot hatch with attitude.